Encompasses all processes which occur to the grapes during the vinification of red and rosé wines, from the tanks to the drawing off. The vatting time allows for alcoholic fermentation and extraction of colouring substances and tannin during maceration. The length can vary from a few hours (rosé wines) to several weeks (great wines for ageing). A wine produced primarily from a single grape variety and so labelled. The Verband Deutscher Prädikats- und Qualitätsweingüter (VDP), an association of the leading wine estates. A smooth, mellow and harmonious wine. A specific mention which can be added to the Alsace and Alsace Grand Cru appellations, for the Riesling, Gewürztraminer, Tokay-Pinot Gris and Muscat grape varieties when they apply to certain strict production conditions, concerning the natural sugar content. The exceptional sugar concentration (220 grams per liter for Riesling and Muscat, 243 grams per liter for Gewürztraminer and Pinot Gris) is obtained with overripe grapes. These are left on the vine to dry up and reduce their juices. This demands very late harvesting which are sometimes done only in the beginning of December. A smell in the 'animal' category recalling the scent of game found in certain fully-developed red wines. First step in the maturation of grapes on the vine. 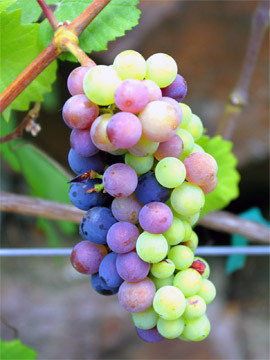 The first colour change from green to purple (in black grapes) or green to lighter green (in white grapes), accompanied by a softening of the texture. A measure of quality of growth expressed by a grape vine, as opposed to capacity which measures quantity of growth and development. Literally, "sour wine." See volatile acidity. 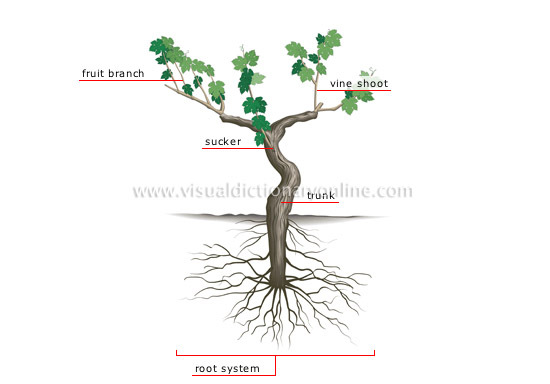 Scientific name of the primary species of Vitis (vines) used for winemaking. Vitis vinifera produces nearly all the world's wines (certainly all the world's best wines). Winemaking, including all the operations and processes involved. Somehow, when you're talking to an audience, "vinification" seems so much more important than "winemaking." Tasting term to describe the "wine like" smell or taste which is common to all grape wines, whether varietal or not. The "year" or season of winegrowing. Vintage wine is defined as wine which is produced at least 95% from grapes harvested in a single, stated year. Note that this is not necessarily the year in which the grapes were grown or the wine was bottled, but the year in which the grapes were HARVESTED. As a sales gimmick, to help promote the highly unusual climate of upper Monterey County, Ca, I harvested wine grapes extremely late in the 1978 season -- on January 2nd, 1979 to be exact. The wine was made in a Nouveau Beaujolais style and sold as 1979 vintage as early as March, 1979! The wine was nice; it sold out quickly and certainly drew attention to the unique climate of Gonzales, California in an interesting way. Wines specified to have been harvested during one and only one specific year, which is named on the label. See Vintage. Common term for anyone in the wine business. It was originally reserved for those who grew grapes and produced wine, but common usage to date includes anyone in wine, whether in sales, marketing or production. The science, art and study of grape growing. Also the root stock or base of the vine, but more particularly the vine trunk as it appears during winter, leafless and fruitless. All the different grape or vine varieties used in an appellation, a region or even a particular estate. Vine cuttings obtained after pruning. These used to be used by vine-growers for heating and cooking purposes, but today are burnt within the plantation due to the cost of having them picked up. A term which encompasses all the phases and necessary techniques used in wine-making. If a fresh white wine is the desired result, malolactic fermentation is avoided. The wine is lightly sulfurized after alcoholic fermentation has ended. It may also be kept in the vat, on its lees until bottling. In some rare cases, less acid wines can be obtained by provoking malolactic fermentation. This is the case for white Burgundy, which is then kept in casks for several months. Sulfurization is only done after the malolactic fermentation. The crop is crushed: the grapes burst open and free the juice. The stems or ligneous portions of the grape bunch are then removed so as to avoid an unpleasant herbaceous taste. Light sulfurization (dosing the must with sulfur dioxide) is done before vatting, to inhibit bacteria and prevent oxidation. Two processes then occur simultaneously: fermentation and maceration. Alcoholic fermentation can either happen naturally or be artificially induced. In the latter case, a yeast culture or yeast starter is added to the must. When necessary, chaptalisation is done at the beginning of fermentation by adding sugar to the must (17 grams per liter) so as to increase the alcoholic content by one degree. The transformation of sugar into alcohol produces carbon dioxide (hence the seething appearance of the fermenting must) and heat. The temperature increases rapidly and should be carefully controlled. Indeed, temperatures exceeding 32ºC (91ºF) risk annihilating the yeasts, which would stop the fermentation process. The wine is pumped over several times during fermentation: the must is pumped from the bottom of the vat and poured back in from the top, onto the 'hat' or chapeau made of marc containing all the solids (skins, pips and stems) which have floated up to the surface. This technique allows for better distribution of these elements throughout the juice, especially anthocyanin. It also aerates the wine, causing it to cool and helping the development of yeasts. Fermentation is completed when all the sugar has been transformed into alcohol, which usually takes five to eight days. The wine is then drawn off and separated from the marc by the power of gravity. The vin de goutte marks the end of vatting and maceration, and may be obtained just after fermentation has ended (in the case of supple wines) or after two or three weeks (in the case of great wines for ageing). The vin de goutte (or wine from last pressing) is put into another vat to undergo malolactic fermentation: the transformation of harsh and aggressive malic acid into lactic acid (smoother and stabilized) by the action of lactic bacteria. Meanwhile, the marc is pressed to obtain vin de presse which will undergo malolactic fermentation in a separate tank. It is then blended with the vin de goutte in various proportions, depending on the desired type of wine. Another sulfurization is done as soon as the malolactic fermentation is over to eliminate bacteria. Vinification is complete: the maturation phase begins. There are other methods of vinification for red wines, such as vinification of whole grapes by carbonic or semi-carbonic maceration. A rosé wine is defined only by its color. It is halfway between white wine (fermented off skins) and red wine (fermented on skins). There are two methods of obtaining rosé wine: by direct pressing or by saignée or 'bleeding'. In the first case, the red grapes are usually pressed after crushing, which allows for a light diffusion of the color-imparting matter in the juice. The pale-colored juice is then vinified in the same manner as dry white wines. The second method follows the vinification process for red wines, with a much shorter maceration period, from 5 to 24 hours. The wine is drawn off during fermentation: the longer the juice has been in contact with the skins, the deeper its color will be. Mellow wines are characterized by residual sugar which has not been transformed into alcohol by the action of yeasts. It is obtained by stopping the fermentation process and the action of yeasts: this may occur naturally, if the yeast is killed by too much sugar and alcohol, or induced by various techniques: filtering, cooling, pasteurization or the addition of sulfur dioxide. Vinifera is the name of the vine species, belonging to the Vitis family. Originally from Europe and the Near East where it was grown long before our time, the Vitis vinifera was most recently imported to America and Africa. There are over 4 000 varieties in the world. The wine-growing regions of France mostly grow Vitis vinifera, and their grapes have many purposes. Certain varieties are eaten as table grapes: there are 600 to 800 varieties of table grapes, of which 25 are grown in France. The biggest competitor is Italy, which is the largest producer and exporter of table grapes. Grapes for crushing produce grape juice, concentrated grape must, dry or sweet still wines, effervescent wines, wines to be distilled for spirits: Cognac, Armagnac. The by-products such as lees, tartar and pomace produce eau-de-vie de marc or marc brandy, grape seed oil, anthocyanins or dyeing substances. Raisins are obtained from two varieties: Corinth and Sultana. The largest producer is the United-States, and Great-Britain is the largest importer. The acetic acid or vinegar content of a wine. Used as an index of bacterial activity since volatile acid arises only from microbial spoilage of wines in the presence of air. Called colloquially "V.A." A pre-harvest before the main harvest to eliminate rotton or defective bunches.